For nearly 10 years, viruses endured as the primary method of attack, and over time they were largely matched by defenders’ ability to block and protect against them. 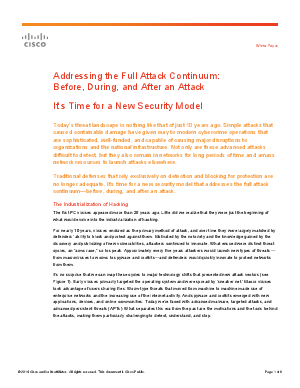 Motivated by the notoriety and the knowledge gained by the discovery and publicizing of new vulnerabilities, attackers continued to innovate. What ensued were distinct threat cycles, an “arms race,” so to speak. Approximately every five years attackers would launch new types of threats—from macroviruses to worms to spyware and rootkits—and defenders would quickly innovate to protect networks from them.